Had a great trip out to Calvert Cliffs this afternoon! It was a haze gray day, overcast with a few scattered sprinkles and temperature right around 50deg F, and from the trailhead we could hear the foghorn blowing at Cove Point. Route: We went in at the hunters’ access lot north of the main park entrance, and followed the Orange Trail to the beach, then back up via Red, crossed over to Black just west of the Blue intersection, then Silver back to the trailhead. GPS data is available here, both for this track and all the trail intersections and points of interest in the park. Full commentary, video and more pictures can be found on YouTube at the link below. Highlights today turned out to be the birds. We saw no eagles, no ospreys, which was a little disappointing (we did see one red-tailed hawk). But, as we descended into the main creek valley where the Orange Trail crosses the marsh of Thomas Branch on the Eagle Walk Bridge, we heard woodpeckers hammering for bugs. Eventually we spotted a mature red-headed woodpecker, and once we correlated that bird to its call (a metallic trill reminiscent of an old-school modem), we were able to track more and more, and watched them investigating nesting holes on dead trees. I’d never noticed red-heads here before, but they were the most common thing around today. There were at least a dozen individuals near Thomas Branch. Crossing the ridge into the more well-known valley along Grays Creek, we noted the contrast between the creeks. At Thomas Branch, the waterway is mostly marsh with lots of vegetation and a little water. The marsh is full of dying hardwoods, saturated by the water backed up by beaver dams, and one by one falling over, clearing the valley. Twenty years ago, Grays Creek looked like this, but now, the trees are all but gone, and Grays Creek is a lake. It’s a totally different, totally new wetland habitat for numerous animals, and it was entirely constructed by beavers. They’ve had a tremendous impact on their environment, and they’re still at it. Fresh beaver chew marks are evident on several trees, and numerous small dams are in good repair. Out at the beach, we ran into some birders with nice binoculars and telephoto lenses, and they were kind enough to let us use them to see the bufflehead ducks and a couple loons diving out on the Chesapeake Bay. The foghorn had stopped, but it was just hazy enough that the horizon on the bay didn’t exist – sky blended into water, and a northbound container ship appeared to hover. The water was too cold to do much fossil hunting, so we headed back up the Red Trail on the boardwalks along Grays Creek. Again, birds were plentiful – A couple juvenile red-headed woodpeckers (more! who knew? ), mallard ducks, and Canada geese. We saw two beaver lodges about 0.4 miles upstream from the primary dam, but got distracted there by eastern towhees scratching around in the underbrush. We had originally planned on using the White Trail to cross north back toward the hunters’ lot, but stayed along the creek until passing the Blue Trail intersection. We then cut north on a spur to the Black Trail (service road), hung a left on Black and then back right onto the Silver Trail. Shortly after that turn, we had a downy woodpecker buzz us and then land nearby begging for a picture. To top it all off, we got back to the trailhead to see flags and what looked like soccer goals – of all things, a local drone racing club had set up a course in the field next to the parking lot. Pretty cool stuff, though the way they were crashing these things I hope they’re cheap! A great day in the woods with the family! Calvert Cliffs State Park is a popular park in Southern Maryland, encompassing a variety of wildlife habitat including hardwood forest, marsh, open wetlands, and the cliffs and beach areas of the Chesapeake Bay western shore. The most popular trail is the Red Trail (aka Beach Trail), which leads 1.8 miles from the parking area to the beach. Fossil hunting is extremely popular here, as fossils from the Miocene Epoch (~23 million to ~5 million years ago) constantly erode out of the cliffs. Shark teeth are commonly found, but the most sought after prize is a complete tooth of a Megalodon, a massive shark thought to be one of the largest vertebrate predators to have ever lived. The park charges a $5 entrance and day-use fee per vehicle. I came to get the other links for the Maryland.gov map and info because I’m a single female and I’m ready to get back into hiking, and was concerned for my safety. Anyway, the link’s not working, so i reckon I’ll go down to the guard shack and check in before hiking. Anyways, I looked at you’re bio, and bc you’re my kind of people (I sail, kayak, and I’m a vet), I wanted your opinion. Would you let your wife hike during the daytime without a conceal-carry? My wife does, in fact, do this sort of thing on her own as a photographer. 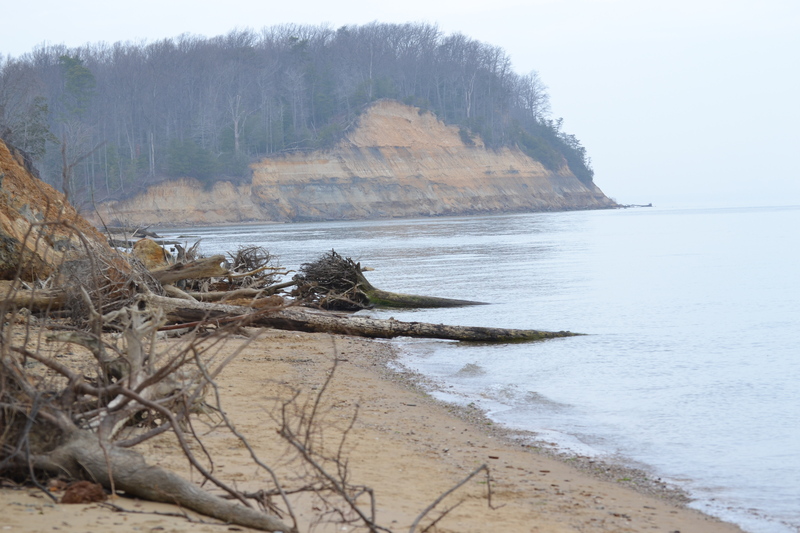 Calvert Cliffs is certainly a safe place, as it’s very popular and populated, lots of families. You would be hard pressed to find yourself alone in a dark alley, so to speak. And you can choose your time windows (weekend, nice weather, etc) to maximize that. All that aside, I’m glad you’re looking to get back out there. Thanks for reaching out, and I hope what I’m doing here can help!